Oregon Rancher Ammon Bundy and others occupying refuge reportedly arrested. 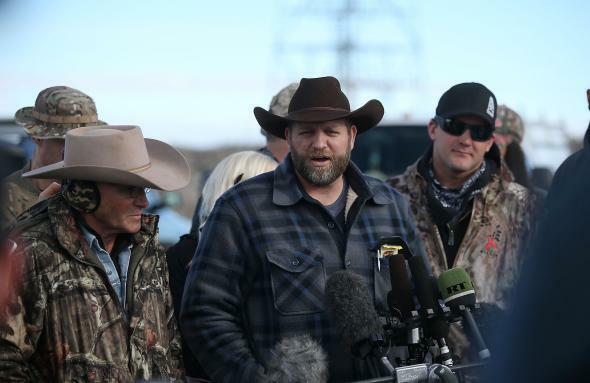 Ammon Bundy, the leader of an anti-government militia, speaks to members of the media in front of the Malheur National Wildlife Refuge Headquarters on January 6, 2016 near Burns, Oregon. Other occupiers arrested and charged with felony conspiracy to impede federal officers were: Ammon Bundy of Emmett, Idaho, Ryan W. Payne, of Anaconda, Mont., Brian Cavalier and Shawna J. Cox of Kanab, Utah. Update, 9:45 p.m.: KATU is reporting that Bundy and eight other militia members were arrested on Tuesday night following a traffic stop. Original Post: Rogue rancher and self-styled strict constructionist Ammon Bundy has been arrested along with other militia members, according to local news reports out of Oregon. KATU News reports shots fired as the militia group was on its way to a meeting. “Highway 395 at the intersection of US 20 north of Burns — not far from the Malheur National Wildlife Refuge — closed in both directions,” KOIN reports. Bundy and a group of armed protesters took over the headquarters of the Malheur National Wildlife Refuge in Oregon more than three weeks ago as a misguided form of protest in support of two other ranchers convicted of arson for conducting a controlled burn on federal property.